You can plan for the future and help Boston Children's Hospital with many different types of gifts. We work with you and your professional advisors to develop a customized plan based on your assets. Please contact us if you have any questions about your giving options. Want to make a tax-free distribution from your IRA to Boston Children’s Hospital? You can! Simply contact your IRA administrator to request that a charitable distribution be transferred to Boston Children's. If your plan requires this request in writing, use our sample letter. Provide critical support for Boston Children’s Hospital. Designate your gift to support the program or department that is most meaningful to you. You must be at least 70½ years of age when the gift is made. Transfers from traditional IRAs or Roth IRAs are eligible. Transfers must be made directly by the IRA administrator to Boston Children's. A maximum of $100,000 per taxpayer, per year qualifies for the tax-free status. IRA rollover gifts can be used to pay a pledge. Contributions for life income gifts, such as charitable gift annuities or charitable remainder trusts, do not qualify. Transfers must be made by December 31 to qualify for the current tax year. Contact your IRA administrator to request that a charitable distribution be transferred to Boston Children’s Hospital or use our sample letter. To ensure your gift is properly recognized, instruct your IRA administrator to indicate the donor’s name on the check and specify the gift is a charitable IRA distribution. Inform us of the designation of your gift by contacting Laureen Cahalane, Senior Director, Principal and Planned Gifts, at 671-355-8062 or laureen.cahalane@chtrust.org. 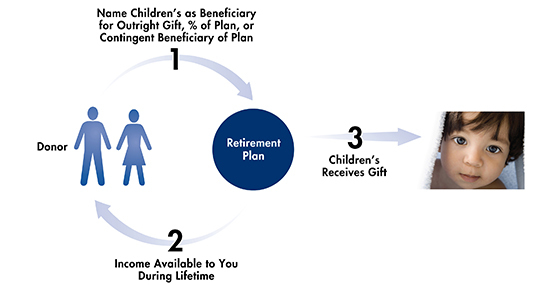 Your Individual Retirement Account (IRA) or other retirement plan — e.g.such as 401(k), profit-sharing plan, money purchase plan — qualifies as a planned gift when you name Boston Children's as a beneficiary of the remaining assets. You can avoid both income and estate tax on the residue left in your retirement account. You can balance your estate by leaving the most-taxed asset to Boston Children's and the more favorably taxed property to your heirs. You can make Boston Children's a partial beneficiary of your plan and direct the balance to your heirs. Make sure to direct your retirement assets to Boston Children's on your beneficiary designation form rather than through your will. Otherwise, your retirement assets will be included in your taxable estate. Retirement assets can be used to fund a charitable life-income gift. Talk to your professional advisors to understand what will benefit your heirs most. Whether you have an older policy you no longer need or you're taking out a new policy, you can make a gift of your life insurance by naming Boston Children's as the beneficiary and assigning irrevocable ownership to us. You receive gift credit and an immediate income tax deduction for the cash-surrender value of the policy. In some cases, you can use the cash value in your policy to fund a life-income gift, such as a deferred charitable gift annuity. You gain the satisfaction of making a significant gift to Boston Children's without adversely affecting your cash flow. You make your gift by naming Boston Children's the irrevocable owner and beneficiary of a paid-up life insurance policy. Your charitable deduction will be either the policy's fair market value or the total of your net premium payments — whichever is less. We reserve the right to keep a donated insurance policy in force during your lifetime or to terminate it sooner for its cash-surrender value. When you transfer stocks, bonds or mutual funds that have risen in value to Boston Children's, you make a significant gift. Furthermore, you avoid capital gains tax and are eligible for a charitable income tax deduction based on the fair market value of your shares. With this giving option, you can make an outright gift or a gift that will return payments to you for a lifetime. You receive gift credit and a charitable income tax deduction for the fair market value of the securities on the date of transfer, no matter what you originally paid for them. You have the satisfaction of making a gift now or funding a gift that provides income for you now and benefits Boston Children's later, such as charitable gift annuity. We recommend transferring your appreciated securities to Boston Children's rather than selling them and donating the proceeds. Your sale will be subject to capital gains tax, and you'll lose the key tax benefit of this type of gift. We recommend selling securities that have lost value and claiming the resulting tax loss as a deduction. You can then make a tax-deductible cash gift to Boston Children's with the proceeds. To give stock of a closely held corporation is to make a gift of a business interest. 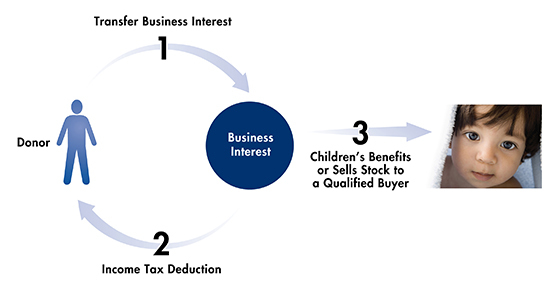 Gifts of business interests have different tax benefits and considerations. Please contact us for further information. Each company has its own requirements, but plan to allow at least one month to transfer mutual funds. Consult your financial advisors first. Then let us know the gift is coming and where you'd like to direct it. Inform your broker in writing that you'd like to make a gift of appreciated securities. Let your broker know when you'd like the transfer to be made. Your broker will need to call us at 617-355-8062 for account information. Learn more about transferring securities. 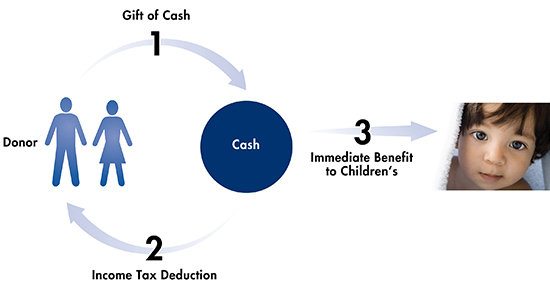 If you enjoy surplus cash flow and want a charitable deduction to offset the largest possible amount of your taxable income, consider making a cash gift to Boston Children's. Use the simplest asset to make your donation — unlike with gifts of appreciated property, there are no appraisal or acceptance requirements. Deliver a gift that Boston Children's can use immediately. Receive a full charitable deduction and apply it against a larger percentage of your taxable income than a deduction for a property gift. You can make your gift with a check, money order, credit card or wire transfer. You can claim a tax deduction for up to 50 percent of your adjusted gross income. You can claim excess deductions spread over the five tax years following your gift. You can also use a cash gift to fund a life-income plan, such as charitable gift annuity. 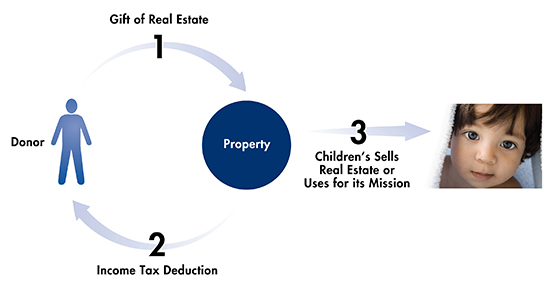 If you own residential, commercial or undeveloped real estate that has grown in value, you can make a significant contribution and receive important tax benefits when you transfer it to Boston Children's. You receive an income tax deduction for the fair market value of the real estate, no matter what you originally paid. You no longer pay real estate taxes, liability insurance or maintenance costs on the property. You can direct the proceeds from your gift to a specific Boston Children's program. With a charitable remainder unitrust, your gift of real estate can return lifetime income to you or continue an income stream from a commercial property. If you sell your property to us at a discount, you'll have the benefits of a charitable bargain sale. When you give your real estate as retained life estate, you can donate your home or vacation property and still reserve the right to use it during your lifetime. Donate books, artwork, equipment or supplies to Boston Children's and receive an income tax deduction. You receive gift credit and an immediate income tax deduction for the appraised value of your gift. You pay no capital gains tax, provided your gift satisfies the "related use" requirements of the IRS. In certain cases, you can use personal property to fund a gift that provides income and benefits Boston Children's (for example, a charitable remainder unitrust). You can have the satisfaction of making a significant gift to Boston Children’s without adversely affecting your cash flow. 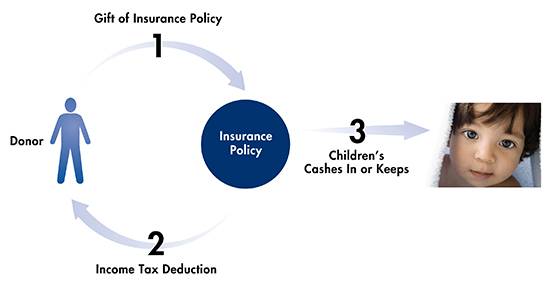 For your items to be fully deductible, the IRS requires that Boston Children's first determine whether we can use them. Please consult with us first. You must have an independent appraisal to determine fair market value for your deduction. If you instruct us to liquidate your donation of personal property for cash, the IRS will limit your charitable deduction to the cost basis of the property. We recommend your personal donations come without these instructions. If we can no longer use or properly care for it, Boston Children's may sell or dispose of the property at a later date. Support Boston Children's by transferring an interest in a real estate, oil-and-gas or other investment partnership. You receive gift credit and an immediate income tax deduction for the appraised value of the donated partnership interest, minus any debt or liabilities it may have. 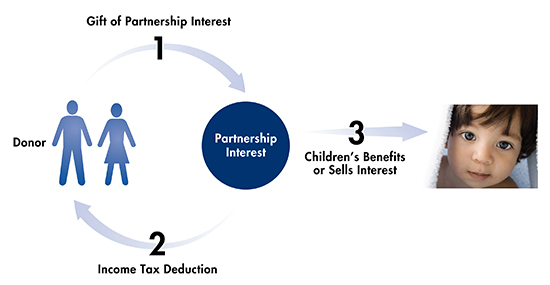 Under certain conditions, you may be able to give a partnership interest to a life-income arrangement, such as a charitable remainder unitrust. You can have the satisfaction of making a significant gift that benefits both you and Boston Children's during your lifetime. First consult with your professional advisors to make sure this is an advantageous gift for you. You must determine if the partnership allows the shares to be transferred. Boston Children's must review and approve the transfer because of issues of marketability, taxation and liability. If the partnership is now making income for the partners, you may want to consider donating your interest. Your charitable deduction will be based on the difference between your share of the partnership's fair market value and its liabilities. 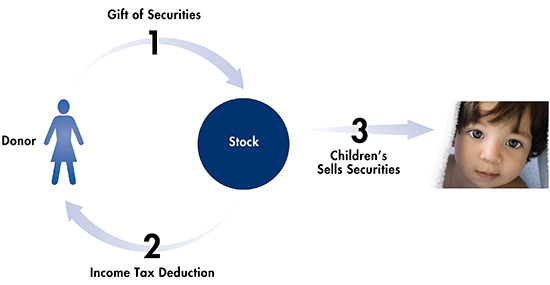 Gifts of business interests — like stocks in a closely held corporation or family business, or shares in an investment partnership — can be beneficial to you and Boston Children's. You receive gift credit and an immediate income tax deduction for the appraised value of the business interests, minus any debt or other liabilities that may be related. You may be able to use a business interest to create a life-income arrangement, such as a charitable remainder unitrust. You have the satisfaction of making a significant gift now or funding a life-income gift that benefits Boston Children's later. Since shares in a closely held business or an investment partnership are not traded publicly, you'll need to have an independent appraisal of your shares. Make sure there are no restrictions on the transferability of shares. Make sure the shares haven't been used to secure a loan from the corporation or partnership. If the loan is still outstanding, you will incur tax liability. Shares of an S-corporation are subject to additional IRS regulations. Boston Children's must review and approve any such transfer before it occurs.